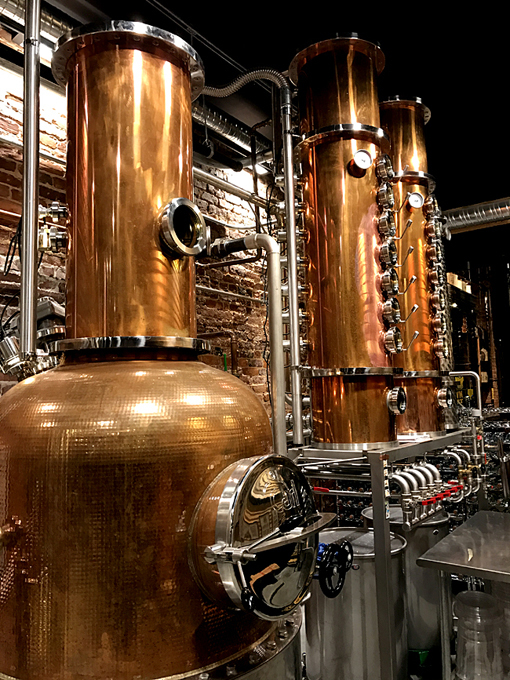 The first legal distillery in Atlanta since before Prohibition, Old Fourth Distillery, located in Old Fourth Ward, has a fascinating history and offers a fine tour! I was there just last week with my friend Nikki, the night before her birthday, and several other friends, some new and some I've known for a while. This visit was part of an uber-fun evening! 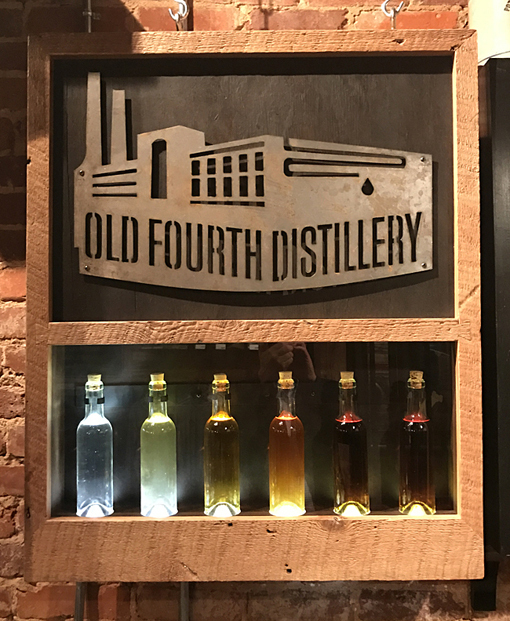 Started by five guys—two are brothers—who left their technology and real estate jobs, Old Fourth Distillery (O4D) has been a great success and they're growing. I hope to see them around for a very, very long time! They currently offer two tours. You can get the basic, highly informative tour (with four tastes) for only $10 or you can get the same tour (you all go at the same time) plus a souvenir package for only $30. Our friends went for the basic tour and Nikki and I opted for tour + souvenir. Nikki's souvenir was a bottle of O4D Gin and mine was a bottle of O4D Vodka. I also purchased a book, "Prohibition in Atlanta", which I can hardly wait to read. There's also other merchandise—hats, t-shirts and the like—available for purchase. Handsome items, I might add. This copper still is stunning. Copper is used for a specific reason, but that aside, it's just beautiful. 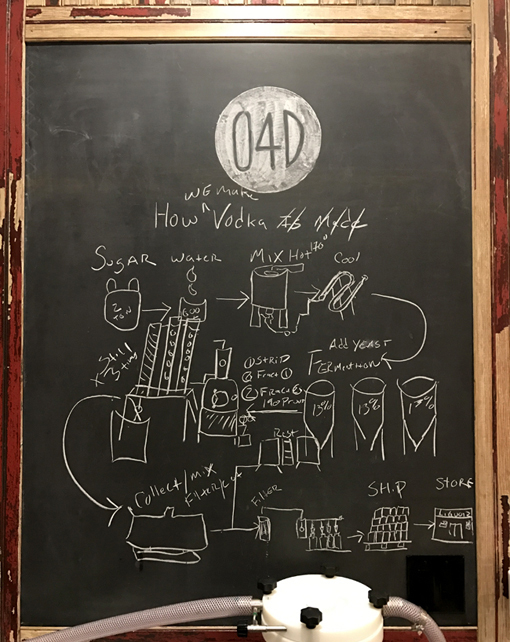 O4D currently has three libations available, O4D Vodka (which is amazing! ), O4D Gin (I don't drink gin, but this was excellent!) and O4D Lawn Dart, a ginger-lemon spirit akin to limoncello. Lawn Dart is a slightly heavier on the ginger, which I love! 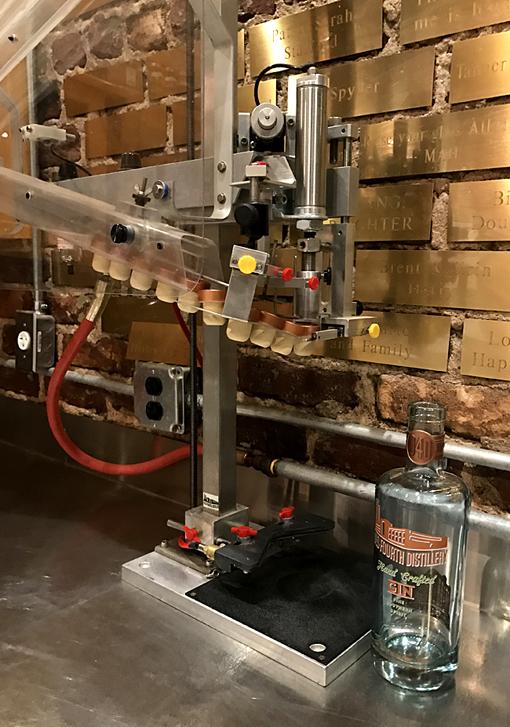 The have a delicious O4D Bourbon coming out in 2019, but you can get a taste of the early batches on the tour! I'm not a bourbon drinker either (I'm a vodka man. ), but this bourbon evaporates on the tongue leaving magnificent flavors that will take you to a place where you'll delightfully contemplate the universe. It's transforming...figuratively and literally. Lights out! I forget what it was that our tour guide William was showing us when he turned the lights out...I was too caught up in the beauty of these stills and missed it. If you too are mesmerized and miss the explanation, kindly ask your tour guide to repeat it, which I'm sure they'll gladly do. Impressive machinery! Our tour group was so much fun! That's William, our tour guide, in the hat. The couple on the right were tourists visiting from Australia and the couple of the left were locals out for a fun evening. I was with the five ladies in the middle, of which one was visiting from Michigan and another is in her first year at Georgia Tech (she was good and didn't participate in the tasting). Our visit had started with just wanting to check it out. 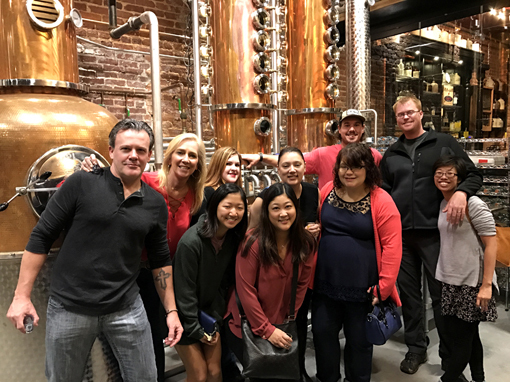 When we finally scheduled our visit, it became part on Nikki's pre-birthday night celebration—one of the most fun of five stops that evening!. 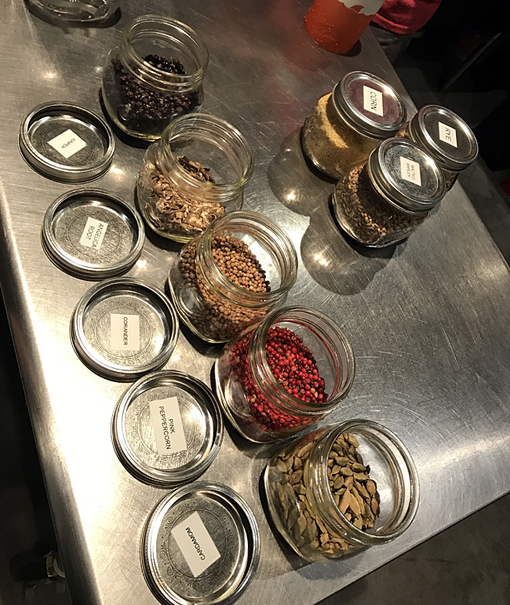 Part of our tour included the manufacturing process of gin, including the opportunity to see and smell the herb ingredients used in making O4D Gin. William explained that Juniper Berries make up approximately 50% of the herb mixture. Also in mix is Angelica Root, Coriander, Pink Peppercorns, and Cardamom. I'm totally not a gin drinker, but this was quite spectacular! I was shocked, not being a gin drinker, to say the least. Did you know that Pink Peppercorns are actually not peppercorns? Because of their size and shape, they're marketed as peppercorns, but they're actually the ripe berries of the ornamental Brazilian pepper tree. Cardamom is one of my favorite spices. If you don't use it, pick up a small jar of it sometime and stir some into your peach jam then spread that on a toasted butter croissant...tell me it's not a little piece of heaven! Yum! I'm a techie. I was in telecommunications when I was in the Navy and my college degree is in technology. So why did the corking machine mesmerize me so? I have no idea, but it was fun to see it in operation. Much of the process is done by hand, as is this part. I admire the graphic design for Old Fourth Distillery. Whether you're a history buff, a steampunk enthusiast, or a graphic design professional—or just like you libation base in a handsome bottle—I think you're going to love O4D's branding. My minor in college was Graphic Design, so I know what a challenge—and great fun—designing a whole new product can be. When you go on your tour, I recommend taking a snapshot of this diagram. It was recently created by one of the staff and it fully describes the manufacturing process. When reading it after I got home, it was remarkable how much it felt like reliving what William had shared with us. There are a lot of entertaining details like this throughout the modestly sized space. There has been much speculation that pre-Prohibition Rufus M. Rose is connected to the founding of Four Roses Bourbon in Kentucky. There's not a lot of evidence either way, but one curious fact can't be dismissed...Founder Paul Jones, Jr. got his start in distilling right here in Atlanta! 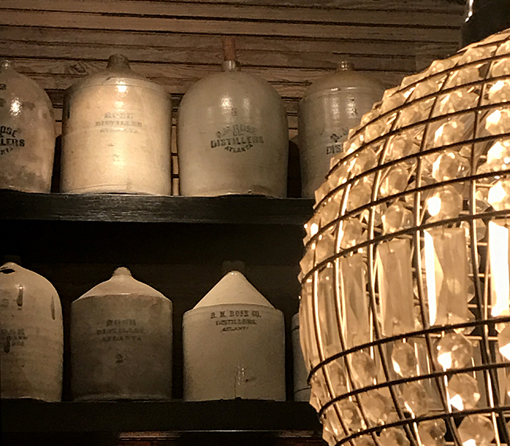 There are many antique jugs on display in the Distillery, some of them bearing the R. M. Rose, Co. name. Now terribly dilapidated, The Rufus M. Rose House, one of the last Victorian mansions on Peachtree Street, was built in 1901 and was home to Mr. Rose until he passed in 1910. The House has since seen many lives. It's been a residence, a rooming house, offices, and at one point, for many years, was an antique store and Atlanta Museum! That museum boasted unique artifacts including furniture belonging to Margaret Mitchell, personal items of Bobby Jones and a Japanese Zero war plane! You're going to find a degree of cleverness here, too. Toward the end of our tour, one of the guests asked where the nearest restroom was, pointing toward neighboring businesses. 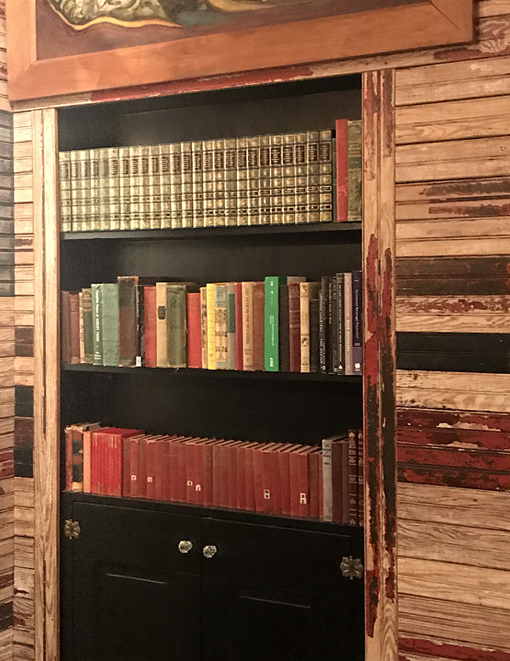 Turns out it was right in front of us...it just looks like a bookcase. Brilliant, right? 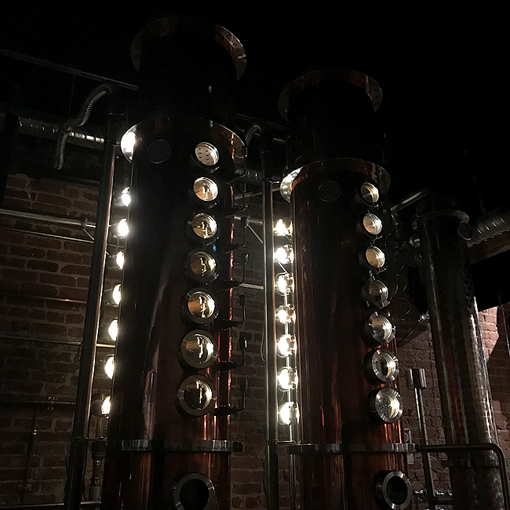 If you need a little more convincing to visit Old Fourth Distillery, check out this AJC article by my friend Leslie Peterson of 365 Atlanta Family. 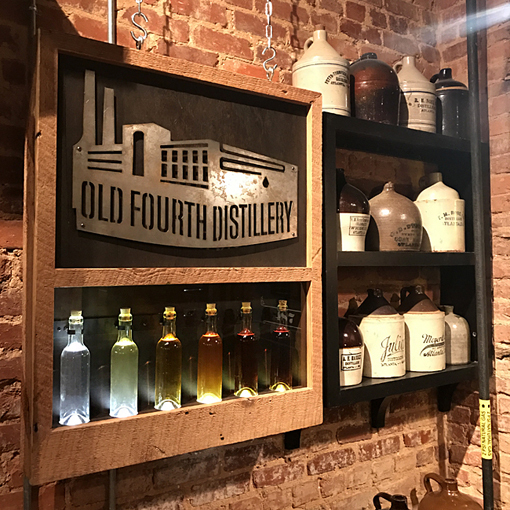 You can find Old Fourth Distillery libations all over Georgia, just go to the "Find It" tab on their website to find a restaurant, store or bar convenient to you. Just know that there's nothing like getting it from the source...their tour is fantastic, especially when you opt for the tour + souvenir and that souvenir is a bottle of vodka! Thank you for sharing! Wow! Everything looks amazing!